It's RELEASE DAY at Taylored Expressions! If there's any "must-haves" that you've seen this week, they are now available for purchase in the TE Store!! I have one last project to share with you today. This card uses the You Are Here set. You Are Here is a great set for scrapbooking as well as for cards wishing someone a wonderful trip or even announcing that you have moved! It coordinates with the die from the Stars & Stripes with Coordinating Die set. On this card, I started by creating the background with the Hexagon Cutting Plate, thought I used it to emboss the design rather than cut it. I stamped and die cut the image of the United States and colored in the places where the recipient with visit on their trip. 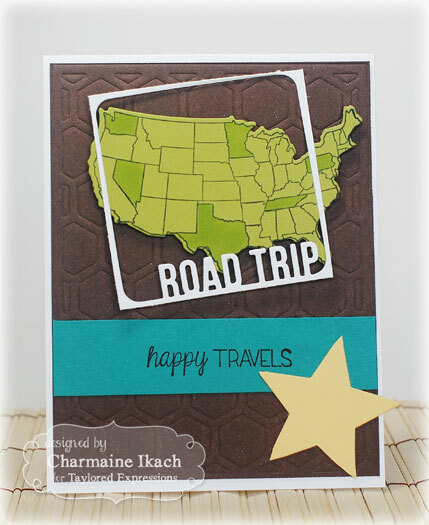 The "Road Trip" frame was created with the Pockets & Pages Fab Frames Summer Dies. The star on the bottom right was created using the Pockets & Pages InstaSquares. Aren't these some fun new dies? I just LOVE them! Be sure to visit the rest of the Baker's Dozen to see what they've created for today! I know you're going to LOVE all of the new products! Thanks for stopping by today and HAPPY SHOPPING! 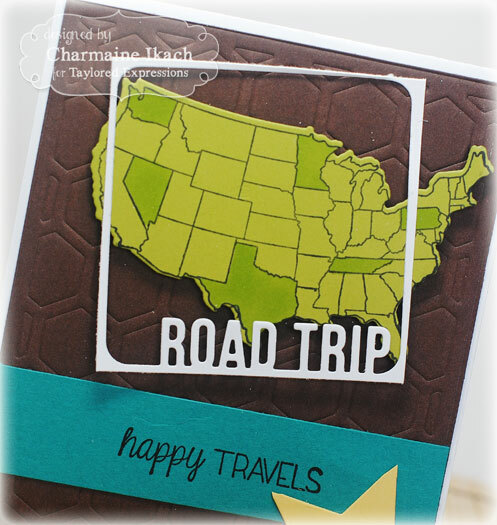 I love how you used the hexagon cutting plate! Great layout too! !